Charles Tillman is so good, you take him for granted. Even during an 11-year career as a member of some of the fiercest defenses in NFL history, his consistent production and greatness are rarely recognized outside of Chicago. “Peanut” owns the Bears’ career records for defensive touchdowns (9), interceptions returned for touchdowns (8) and forced fumbles (39). Thanks to his signature move the “Peanut Punch,” his 10 forced fumbles last year set an NFL single-season record, and the four fumbles he forced in a game against the Titans a year ago is the all-time single game record. His 36 career interceptions are just two away from tying Gary Fencik for the Bears’ franchise record. 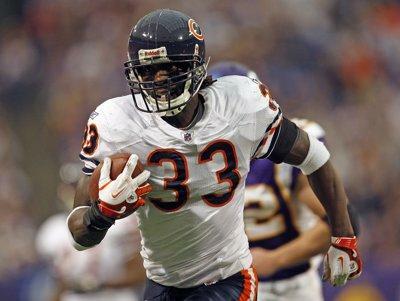 With two Pro Bowl selections and an appearance in Super Bowl XLI, Tillman’s overall body of work solidifies him as the best cornerback in the history of the Chicago Bears and potentially as the most disruptive defensive back of all-time. You’re working with Proctor & Gamble on a campaign for breast cancer awareness. Tell me about that. I partnered with P&G to encourage women to have an early detection plan with breast cancer. And, for the men in their lives, to motivate the women in their lives to create a plan. Everyone talks about how October is breast cancer awareness month. We have pink gloves, pink shoes, pink wrist bands, but it doesn’t just end there. Breast cancer doesn’t wait; it comes when it wants to. And you shouldn’t wait. Go to PGEveryday.com/bca and get the app. This app will give you notifications that you need to go see your doctor this month, or get a checkup another time, and it gives you a reminder to have an early detection plan. If breast cancer is detected early enough, there’s a 98% survival rate. I’m not a math guy, but I will take those odds. You’re the most physical corner in the NFL, which for some reason is very rare in the game; to have a real physical corner that can stop the run and jam receivers at the line. Why is that? Why are so many corners soft, and can we blame Deion Sanders for that? No, I don’t think you can blame Deion for that. I think it’s just what is required of our defense. And it’s not just me; my other Pro Bowl corner Tim Jennings… he and I are in the same boat. I think there are a lot of physical corners, not just to name myself and Tim. But I think what makes ours more evident is the type of defense that we play. It’s required that our corners make tackles and make plays.